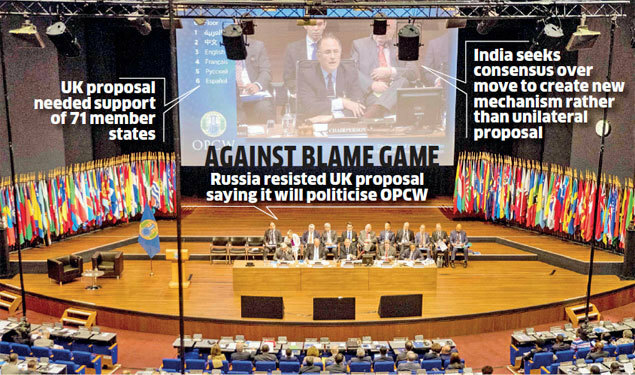 NEW DELHI: India on Wednesday voted against UK at the Special Session of the Conference of State Parties to the Chemical Weapons Convention in Hague in what can be viewed as support for Russian position. It was convened by UK to propose that Organisation for Prohibition for Chemical Weapons (OPCW) should be empowered not just to investigate whether chemical weapons have been used in an incident but also to identify the group or government responsible for it. India voted against UK proposal along with 23 other countries. As many as 82 OPCW member states of OPCW voted in favour of UK proposal. The proposal needed support of 71 member states. 106 members were present. India called for consensus over move to create new mechanism rather than unilateral proposal. Russia, already at loggerheads with the UK over the use of a nerve agent in Salisbury, fiercely resisted the move, saying it will politicise the OPCW. Earlier in an oblique criticism of UK’s move for unilateral proposal, India even as it opposed use of chemical weapons, called for constructive engagement, dialogue and unity of purpose at the Convention. Addressing the Special Session on Tuesday in The Hague, Ambassador and Permanent Representative of India to the Organisation for the Prohibition of Chemical Weapons (OPCW), Venu Rajamony had said it is important that the extensive support and universality that the OPCW enjoys is not dissipated, as this would undermine the long-standing credibility of the organisation. India attaches the highest importance to this organisation and has therefore always emphasised the importance of consensus and the need for all decisions to be taken by the members of OPCW in consultation with each other while taking on board different points of view. Rajamony had said while there is unity on the goal, there are strong differences on how to achieve this goal. Any long-lasting and effective solution to the challenges faced by the OPCW can only be found through wide ranging consultations among States Parties. “It is important to maintain the credibility and integrity of the Convention. All investigations of alleged use of chemical weapons should be conducted in an impartial and objective manner and strictly in accordance with the provisions of the Convention, “ he said. He urged that all provisions of the Convention be utilised to address these concerns.